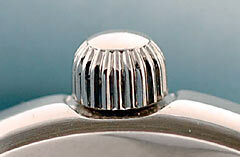 Watch crowns of every type are available from us. 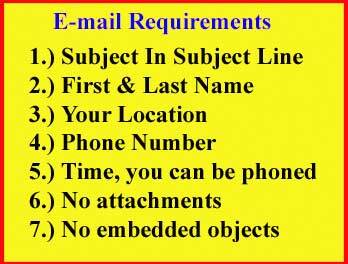 If you have Bestfit Books, we also have the Bestfit system of crowns and you can order by Bestfit numbers. Assortment of 24 pieces, 12 in 316LS stainless steel 2 each of 4, 4.5 and 5 mm with tube opening 2.0 mm, 2 each of 4, 4.5 and 5.0 with tube opening of 2.5 mm. In 3 micron gold plating are 2 each of 4, 4.5 and 5 mm with tube opening 2.0 mm, 2 each of 4, 4.5 and 5.0 with tube opening of 2.5 mm. 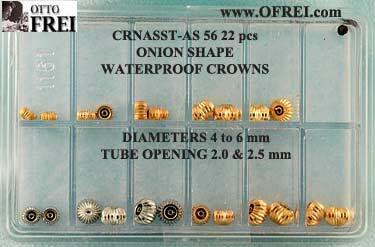 Needing Onion shape waterproof crowns? New assortment of 22 pieces in both stainless steel and gold plated. 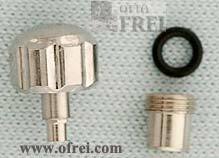 Two each stainless steel 4.5 mm, 6 mm tap 10 (0.90 mm thread) with tube opening of 2.0 mm and two 6.0 mm tap 10 crowns with tube opening of 2.5 mm. 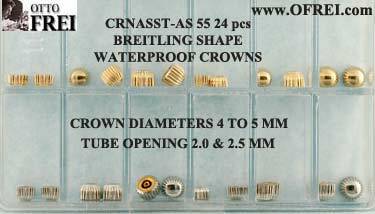 Two each gold plated 4, 4.5, 5, 6 mm tap 10 crowns with tube opening of 2.0 mm. 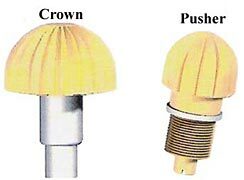 Two 6.00 Tap 6 (1.20 mm thread) gold plated crowns with 2.0 tube opening. Two each of gold plated 5 and 6 mm crowns tap 10, with 2.5 mm tube openings. Two gold plated 6.0 mm tap 6 (1.2 mm thread) with 2.5 mm tube opening. 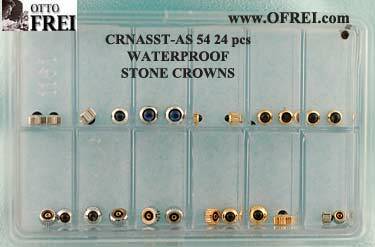 Stone crown assortment contains 2 each of the following: Steel 3.0, 3.75, 4.0 and 4.50 mm with 1.6 mm tube openings and blue stones. Steel 4.5 diameter with 2.0 tube with blue stone, Steel 4.0 and 4.5 mm diameters with 2.0 tube opening and black stones. Gold Plated all with black stones: 4.0 and 4.5 mm diameter crowns with 2.0 mm tubes, 3.0 and 3.5 mm with 1.6 mm tubes and 3.5 mm with 1.8 mm tubes. Total of 24 pieces.